Many of my foodie friends know that I was heartbroken at not being able to get a reservation at The French Laundry in Yountville on our recent vacation. One of the two 3-star Michelin restaurants in the Western US, this famous restaurant has a 9-course tasting menu where no (major) ingredient is repeated. The wine list is 100+ pages. NONETHELESS, you must call 60 days in advance at exactly 10 am to get in, and not knowing this, I waited until noon on June 5, to get a reservation on August 5. When I called, they said all the lunch and dinner bookings had gone by 10:30 am. By the way, dinner there is $270 per person, not including wine (but does include tip)!! 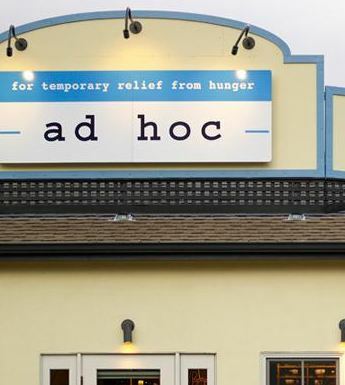 BUT, there are 4 Thomas Keller eateries in Yountville, so we “settled” for Ad Hoc. I had bought the Ad Hoc cookbook pre-publication, and it is one of the most emotionally moving cookbooks I’d ever seen. Love in every dish. 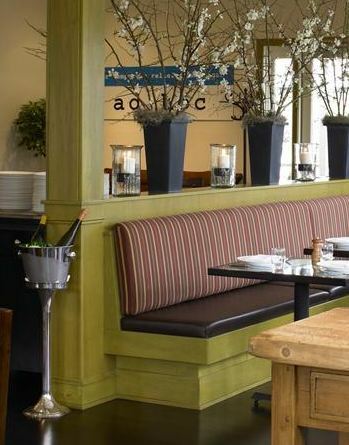 Well, long story short, we had a great meal at Ad Hoc. They serve a set menu ($52) which changes every night, so you take a chance that you might not love what they are serving, but we loved it! They have a beautiful herb and vegetable garden out back, and obviously they use what’s fresh there. They use different style serving dishes, so your first course and that at the next table could be plated very differently, which makes it more interesting to spy on what your neighbors are eating! 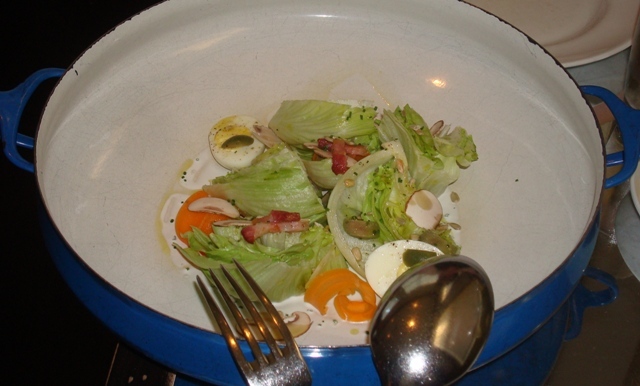 Salad of Baby Iceberg Wedge, with egg, olives, bacon lardons, sunflower seeds, crimini mushrooms and an herb cream dressing. Served with Lahere Freres Champagne. We wanted more bacon, but all the flavors went so well together, and the Champagne was a perfect fit. 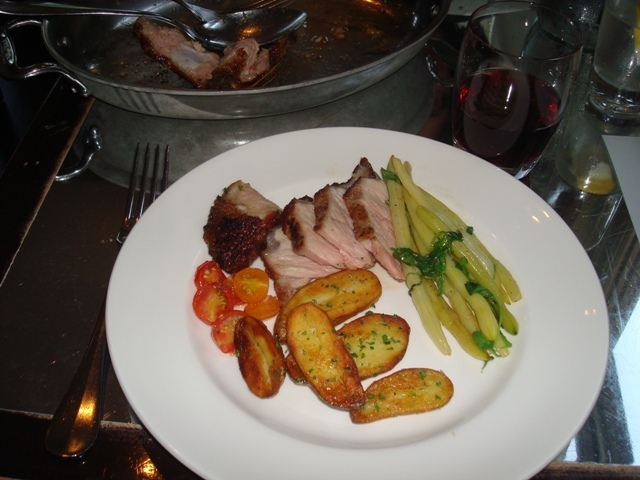 Veal Costalletta Chop, with wilted arugula, yellow wax beans, tomato-sage relish, and la ratte potatoes with gremolata. Served with Hirsch Bohan Dillon Pinot Noir. Loved the incredibly fresh tasting tomatoes (undoubtedly from the backyard garden) as a relish on this very tasty and tender veal. 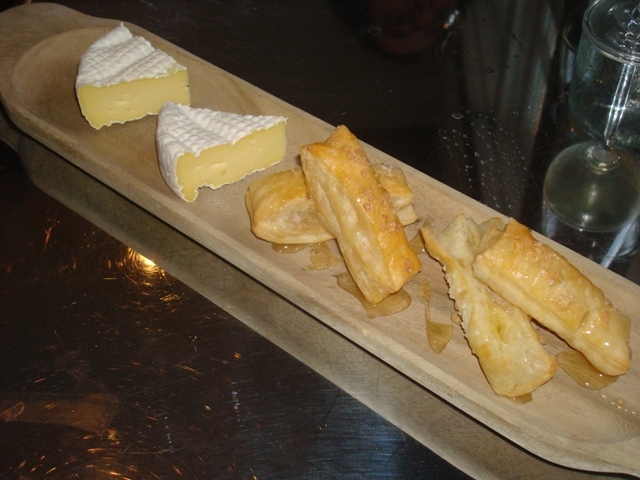 Sweet Grass Dairy’s Green Hill Cheese, with puff pastry squares and honey. Served with Moscato D’Asti Saracco. The cheese was delicate, which went well with the delicate pastry. My wife loves Moscato more than I do (I find it too sweet), but this was good. 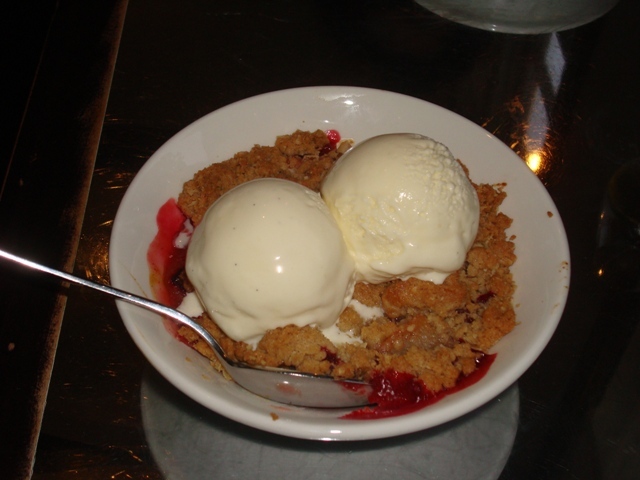 White Peach & Plum Crisp, with oat streusel and vanilla ice cream. Served with a Chardonnay / Welshreisling blend by Kracher – Austria Anslese Cuvee. I’m a snob about crisps, because I make a good one, but this was PERFECT. Nice tart absolutely wonderful fruit (not too much sugar – which I prefer), and a sweet crisp top. The perfect end to a great meal. Wine paired perfectly. The experience was very satisfying and homey too. We’re glad we went, and it makes me want to plow through the Ad Hoc cookbook – especially the Fried Chicken, which they serve twice a month – I’ve posted the recipe for this already. This actually seems a doable task. Not like trying Julia Child’s Mastering the Art of French Cooking! Bonus: For the fun of it, you can subscribe to an e-mailing of the daily menu. It is an inspiration to all foodies!